Two On Two Off: Who's With Me??! Jeans are the one thing that I have enough of! But I would love to see what other sewers make. I've had the Jalie pattern since the beginning, and have yet to trace it off! I have the stretch denim (a few cuts), so it's really time to commit. I'm such a chicken, even knowing how much success everyone has had with this pattern! Since I don't yet have the pattern nor any suitable denim, I probably won't have the time to join up this go-round. However - I've been looking for light-coloured denim-like fabrics for summer, and discovered that www.fashionfabricsclub.com has a lot of stretch cotton twills suitable for slacks. My search for "cotton lycra twill slacks" found plenty of hits. Denim is a twill weave cotton. FYI, no association, yada-yada. I'll join! I just bought a couple yards of black stretch denim, and I was thinking of the Jalie pattern for the mini-wardrobe contest. I have the denim and the pattern and was planning on making my first pair over our Spring break. Count me in! I would love to join. I just got the Jalie jeans pattern in the mail. It's my first jean that I am attempting in a very long time. I went with Jalie because of all the great reviews. It would be nice to have all of the tips and tricks from everyone else. I am looking for some good stretch denim so I am waiting to hear your report from Fabric.com. Count me in! I'm supposed to sew a pair (my first) this month or the next! I'm excited!!! It's great you've got all those great jean fabrics coming in the mail. Please educate us on the difference between the various oz. Can't wait to see your new pairs!!! My Jalie pattern arrived today(!) and I have some black stretch cotton twill in the stash that may or may not be "denim" but is a jeans weight. Finding time to keep up will be an even bigger challenge than tailoring a pattern to fit, but I'm eager to see if I can do it. I just got the Jalie pattern a couple of weeks ago, and thanks to your "heads-up" I have some stretch denim on the way from Fabric.com. I would definitely be up for a sew-along. Is this a sew along just for that Jalie pattern and just for spring ? If you don't mind a little southern hemisphere opposite season autumn wear in cords and a different pattern, I'll join ya! I'm in! I've got my Jalie pattern and my fabric. Whoo Hoo! I'm in! I just finished a pair of Jalie's I started on, in Dec. Unfortunately, (becuz of weight loss) they are now a tad bit big, so I'm ready for another pair. I'm also waiting on some rivets from ebay,so count me in! Well I bought the Jalie jeans pattern after you and the selfish seamstress raved about it and showed your great versions, so it will be good to have the motivation to use the pattern. Count me in, let us know when you're starting as my stash only has some glittery denim in which is a bit scary so I will need to shop! Phew! I don't think I'm up to sewing denim yet. But I'll read your reports with great interest. try with the pattern of Don in Weekend designer. Older posts. Inside pocket is always under pressure, so do not bother yourself, you must have a reason to make a new pair. But anyway, is it so hard to find a good pair of jeans in your shops? We buy them here in Serbia sometimes for less than 20 USD, if you want premium style you will pay about 200 USD! It's making me a little crazy that you haven't mentioned replacing the pockets ;) I love mending clothes and keeping them wearable! New jeans are fun, too. I would love to give the jeans a try. I've got the pattern, just need to get some fabric on order. Count me in. I just got the Jalie pattern a few weeks ago, and I need to commit to finally making a pair as I've wanted to do this for quite some time now. Please count me in. I have the Jalie pattern and the stretch denim. I have seen the success sewers have had with this pattern and it would be fun to make a pair! Does is have to be a Jalie jean pattern? Count me in, too. Just provide the link. Ditto Summerlea - fix the pocket! Not that you can't make another pair, too. 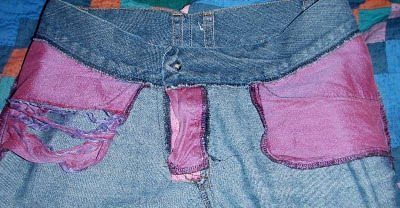 But, don't waste a great pair of jeans because of skimpy pockets.